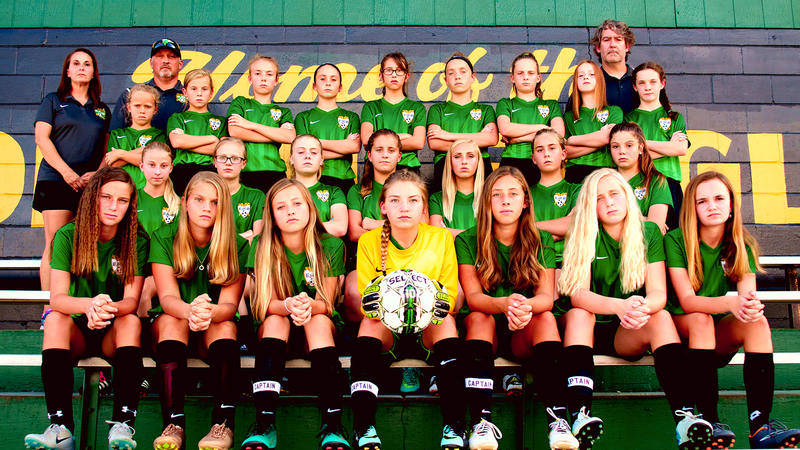 Chattanooga, TN — The Rhea Middle School Girls Soccer team played in the SETAC district tournament recently. Due to conference rules the RMS squad received losses for two cancelled matches due to the recent torrential rains and entered the tournament as the 4th seed. On October 2nd, the ladies had to knock off some rust due to being off for 10 days because of unplayable field conditions but took control of their game against an improved Ocoee Middle School team to win 2-0 off of goals by Savannah Tilley and Julianna Prescott and advance to the conference semi-finals against perennial conference champion Athens Middle School on October 3,2018. Little did the Lady Eagles know that they would soon make history. The gritty Golden Eagles out fought an Athens team that had been undefeated over the last 4 years to win the match 1-0 off a gorgeous long range shot the dropped just below the crossbar from 30 yards from Emma Reeves off of a dropped back pass from the striker Prescott. The lone goal was all the Eagles would need as they played smothering defense and received some timely saves from goalie Shaylie Needham in holding off a late charge from the quality Athens club. Unfortunately,the Lady Eagles spent much of their emotional and physical energy 24 hours earlier when they came to play a very good and well rested Chattanooga Christian Club on October 4, 2018. The Lady Chargers jumped out to a 3-0 lead and never looked back as they defeated the Lady Eagles 5-0 leaving RMS as the conference runner up. This over achieving Rhea Middle School girls’ squad finished 7-4-1 on the seasson. Their second place conference finish is the schools best ever. They also registered their first win over Athens Middle School in program history. I feel that this years finish shows the continued improvement in Rhea County Soccer! The RC3 recreational and club programs, our middle school program, and high school program continue to become more and more competitive as soccer grows in our community. I believe the future of soccer is very bright in Rhea County.